Nintendo pisses me off. I know it’s all about marketing and blah blah blah, but just release the damn game on the VC. And localize M1+2 and M3. I hope these games top the charts for the rest of time so they’ll never stop being reminded about it. I don’t see why NP bothers having the RPG and SNES polls anymore. They might as well just print the word “EarthBound” on the entire page. 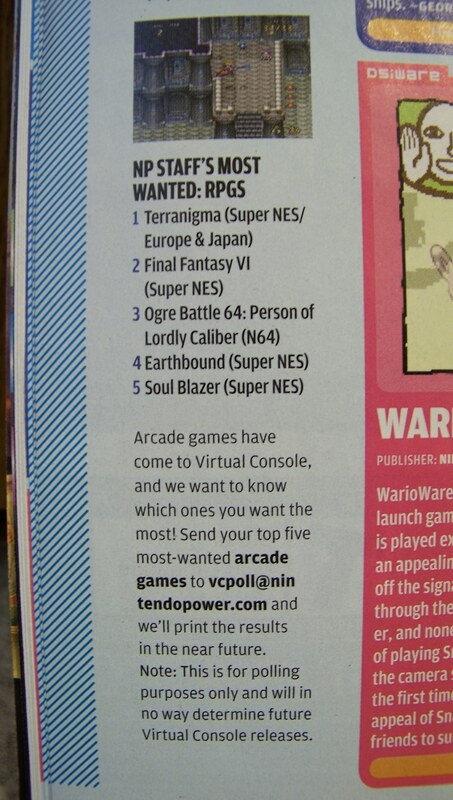 Let’s not forget Terranigma, which is equally as better than Chrono Trigger as any of the other non-square games listed up there. That’s right, I just said CT was better than FF. But worse than ‘nigma and EB. Crap, and I even forgot to vote! Repeat every month as necessary. At least they have FFVI, I’ve wanted to play that for a while. I don’t know. 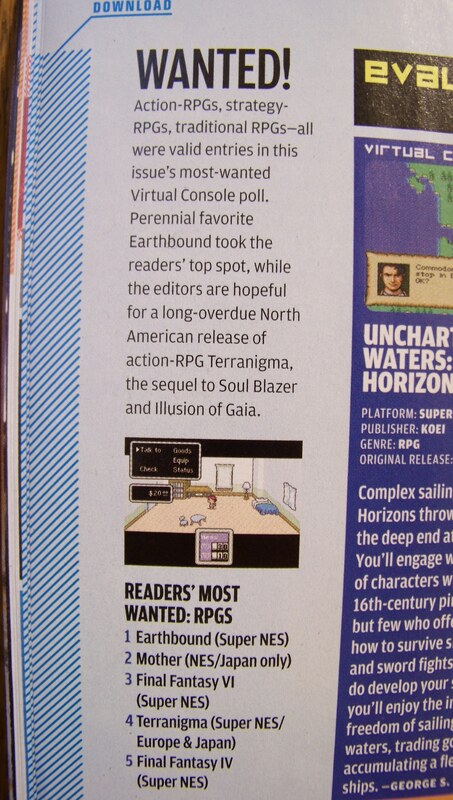 I’ve always thought Illusion of Gaia was better than terranigma. But I’m weird like that. Personally I find the Earthbound thing alright. The rom’s not legal but if you notice it’s not exactly protected either. WTH! I submitted this a week ago. Please don’t tell me there was a problem with the attachment system again. That’s like the second time that happened to me. Considering the news that Earthbound is worth so much. Losing my copy ages ago. VC is the only legit way I’ll ever get to play Earthbound again. I don’t see that in my future. Such a shame. The Great Morgil: I replied to your message asking about that but you never responded. Earlier this week I did finally fix the attachment problem though. Well I didn’t think there was much point in putting up Earthbound and how it does in Virtual Console polls due to the legal issues the game has that was shown a couple months ago concerning music and other stuff, but I guess we have to stay up to date with how its doing on the VC polls but I just don’t see what posting how much people want it and its demand on the VC polls will do other than tick a ton of people off after discovering the said legal issues Mato mentioned those few months ago thus preventing any kind of release in any way or form and just see that problem. 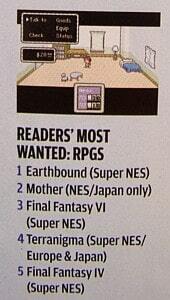 Truth is I don’t see too much point in showing around here how well Earthbound is doing on the VC polls, becuase it doesn’t really matter how well it does, unless it can come out on Virtual Console than there isn’t much point in showing this in news because if we now know about its legal issues preventing it from coming out and know that it will stay buried then the Virtual Console poll is nothing more than just a bunch of people begging for something they can’t have. Not trying to be negative but I’m just stating the truth, though it may be nice to see its the most requested game to people like Me its rather disappointing to see that like Me there are a lot of people who are wanting something they can’t have and are probably made up of people who are curious and will never play it on VC or like Me will have to resort to piracy to play. Its a real shame because those people really do desreve a chance to be introduced to Earthbound and get familair with Ness’s roots. So its kind of a slap in the face to Me and I know they’re proabably going to have a meltdown when they hear it won’t be released. Just because its at the top doesn’t mean it’ll be released, despite what people think, but I could be wrong I have been before but not a whole lot of the times I wanted to be but this time it seems like I am not matter how much I don’t want to be. Oh well just don’t get to excited Nintendo Power readers and subscribers and don’t get your hopes up just read the issues here and if you decide to act like a new fan I respect your feelings but its really out of our control. You could have said that ramble in one sentence. I don’t think its important, and infact I think its horrible that we focus on EB winning the polls in NP while EB can’t even be released on the VC due to legal problems. EarthBound’s won so many of these polls, eventually Nintendo will be forced to at least acknowledge the demand, if not release it. Ok sorry about the little ramble then guys but at least you were polite (unlike those jack***es down at Youtube when I post a comment on the Let’s Play Banjo-Tooie) but anyways I guess you’re right it’s just I feel sorry for the people who are asking for the game because a lot of them are Smash Bros. players who would love to play Earthbound to see where Ness orininated from yet won’t due to these issues and some aren’t even aware of the problem so they keep wondering why it never comes out. But anyways you made Me realize thats why we’re here to introduce them once their cuirousity brings them to places like this. But I also thought this yesterday who knows it may not be today tomorrow or even in the next couple years but maybe one day copyright laws will change and it will be released one day. Well I’ll end this before it gets too long I’ll just end this with saying I hope those curious people who want to play Earthbound to know of Ness’s roots get to one day, so they can become true Mother fans. But wait didn’t Nintendo support the Fan translation of Mother 3 by buying Mato drinks? (Or that wikipedia artcile could be false) but if they did they were supporting the piracy of one of their games. Shows how much they care about this series, but then again they haven’t actually released a decent thing on the VC in ages last two things I downloaded were Mario RPG and Legend of Mana (no one kill Me I can like other famous SNES RPGs as well). Its kind of sad yet cool at the same time, I don’t know too many other gaming companies who would actually support the piracy of one of their franchies and turn a blind eye to the illgeal downloads of the three of them. But its more than just between NOA and NCL its also between all the bands famous people other games and who even knows what else the game is infringing on, but it might come out one day, like I said maybe not today tomorrow or even the next few years but like I said perhaps copyright laws will change one day and the game can be released (I do hope and pray they change one day as its hitting Youtube pretty hard), but anyways the other game I was hoping for besides Earthbound was Tetris Attack (the puzzle game with the whole Super Mario World 2: Yoshi’s Island theme for the SNES) I mean I understand Earthbound has legal issues but they have no excuse for Tetris Attack. Then again I haven’t seen a decent release for the Wii Shop Channel in ages Virtual Console has been pretty lame these past few days and Wiiware is nothing but Puzzle games and defend your castle stuff and nothing interesting, I was hoping I’d see more stuff like more adventure platformers or even a small RPG or at least some more stuff which your Mii is more involved with. Anyways yeah i’m done see ya guys sorry for the rant. Couldn’t the Parody Act cause at least part of the music to be covered? Nintendo could just have a statement somewhere in the intro or credits stating that what ever could possibly be filed against is a parody made purely for comedic purposes. I don’t know all the details but I suppose it may appease some of the problems with legal issues. Or maybe I just missed a crucial part of that law and look stupid. Those morins STILL haven’t re-released it. I don’t have the dough for a SNES. Well I wouldn’t know, you’d have to ask Mato at the Earthbound & Legal issues news that was posted a couple months back, he doesn’t know about it all entirely himself but he does know more than I would. For example he told Me the reason Nintendo hasn’t been sued for all that stuff being in the game in the present day or anytime after Earthbound became more famous and people started taking more notice and playing it however they could (the age when Smash Bros. made players curious so they decided to give it a try any way they could) is because he assumes theres a statue of limitations preventing Nintendo from being sued for it from when Earthbound got more famous all the way to the present day, but it doesn’t keep them from being sued if they’re to release it again. Also he even knows that copyrights in Japan aren’t very big. You see tons of American stuff in Japanese media that would normally infringe on American copyrights. So I would suggest asking Mato (or at least someone else down the old Earthbound & legal issues news) why Nintendo couldn’t just use the Parody excuse to get out of it (just be sure its down at Earthbound & Legal issues though, but i can’t say I can promise you’ll get a reply). I think you got some of that information wrong. I think the greatest factor is that there’s now an internet with fan sites, wikipedia, and google to find out these things. Anyway, the parody thing probably would hold up in court, but that’d still mean you have to go to court, which is what they’re avoiding altogether because it costs lots of money. Also, given that there are lots of “similar-sounding” things, that could very well be multiple visits to court, which is even worse and it’s understandable why Nintendo would want to avoid that. Ah, well its been a while since I’ve read some of that information, so My memory is a little fuzzy. But anyways there is your answer Threed Survivor. And I’m guessing even with Nintendo being a major company, I doubt that they’d be able to afford all those visits. Its not like they have the same kind of cash a company like say Disney has and be able to get themselves out of the hot water each time until every last thing in the game that could possibly bring them to court is out of the way. So yeah, though I doubt putting a disclaimer at the beginning or end of the game will change anything (the whole putting a comedic purposes disclaimer). I suggest looking more at Threed Survivor’s question about it though Mato (thats only if you haven’t looked at it already) as it was their question not mine, I was just telling them to ask you and telling him what I remembered. Anyways if they does ever come back to look at this news again I’ll leave you to answer anything he has to ask because well I don’t know too much about the laws and how they work, but you kinda do understand a little bit more. So I’ll just leave all the things they ask to you. F#$* Nintendo! Can they not see the two games that are dominating the VC polls?! But anyways you all have to remember the legal issues that were shown here a couple months back before you go off at Nintendo, as theres more to it than just Nintendo refusing to release it because they don’t care, but them also trying to avoid lawsuits. Like I said it doesn’t matter how much EB and EB0 do well on the polls, so long as those legal problems are there just winning a most wanted poll is not going to get it released as those issues are bigger than all the fans wanting it on there put together, and well the legal problems sort of overpowers us, well at least in todays world concerning copyright laws. See the above I wrote out above or at least check out the Earthbound & Legal Issues news that was posted about a year or two ago. It’s copyright issues with the music and stuff if you want even more detailed information, like Nintendo will still have to go to court a lot since theres a ton of pop culture references which costs a lot I mean even with the parody act it can still happen (I don’t know how a game like Conker’s Bad Fur Day ,a game which also has the music from Clockwork Orange and a ton of movie references, can get away with calling the stuff it has in it parody and not Earthbound though, maybe it has something to do with the fact that it was made in Europe). But stilljust winning the most wanted poll in Nintendo Power won’t get it on Virtual Console it’s in whatever faith you have (or anything you put this kind of situation) hand’s now. I mean copyright laws are bigger than this whole fandom and even Nintendo. I mean theres nothing more we can do, I mean believe Me I’ve seen firsthand how bad copyright laws can be. Since I’ve seen how it’s affceted Youtube and even music videos get pulled for one reason or another including My own. Heck it’s probably going to take a while for copyright laws to change if they ever do. Well I guess all we can do is just hope for the best that one day Earthbound comes out on Virtual Console some way.